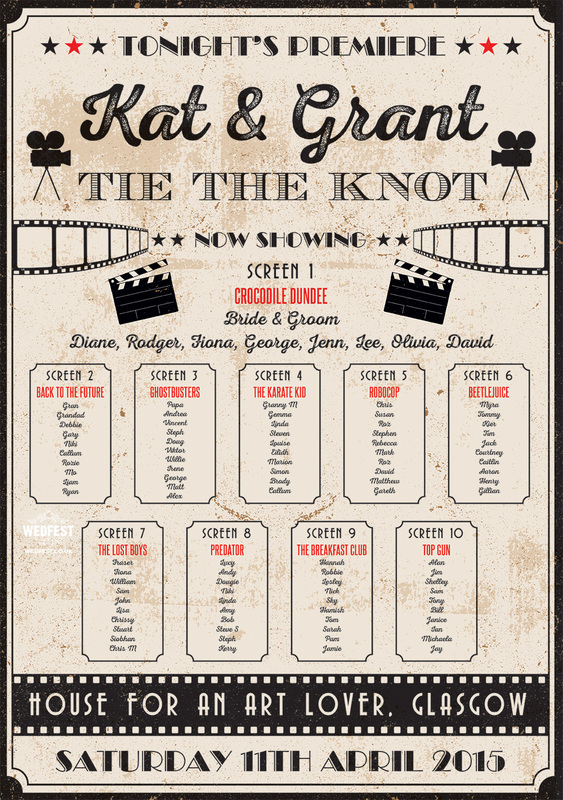 Vintage Movie / Cinema Themed Wedding Stationery – When Kat & Grant got in touch looking for wedding stationery for their wedding they knew exactly the theme they were going for which vintage cinema and movies. 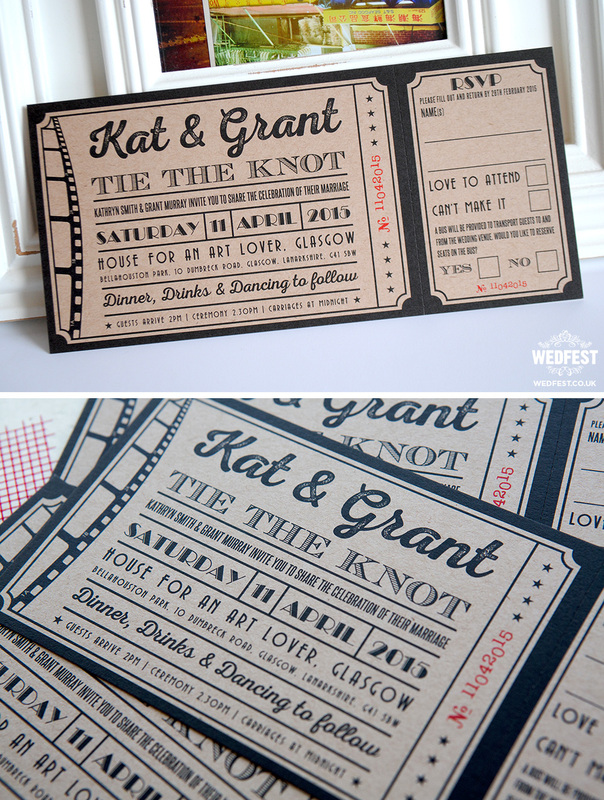 After seeing a few vintage ticket wedding invitations we had designed Kat asked could we design her a vintage cinema ticket wedding invitation. The answer as always was of course we can!! 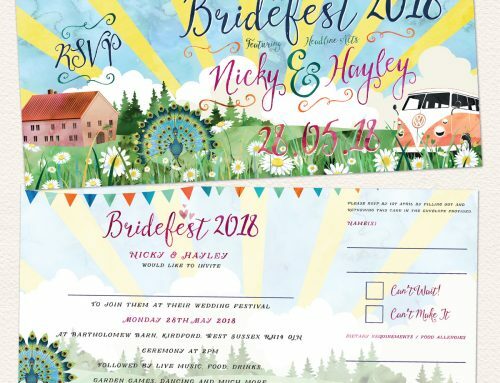 The Bride to be didnt want a lot of colour and wanted it to look vintage and retro, so with that in mind we stripped back all colour leaving just black ink and some red for the ticket number on the design which is of course the wedding date. But we weren’t going to leave the invite just black and white, thats not the look we were going for. 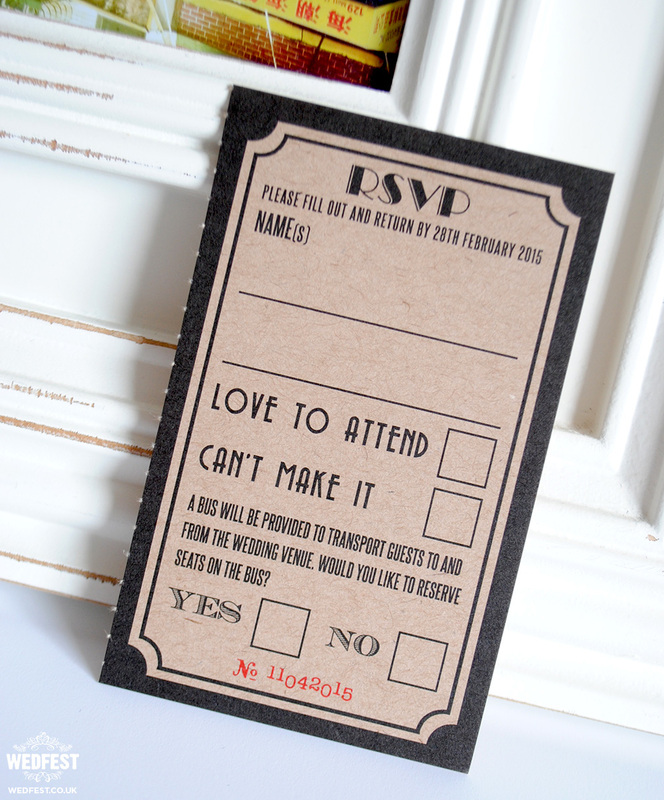 To make the wedding invites look and feel like vintage cinema tickets we printed them onto brown kraft card and the results as you can see were beautiful. 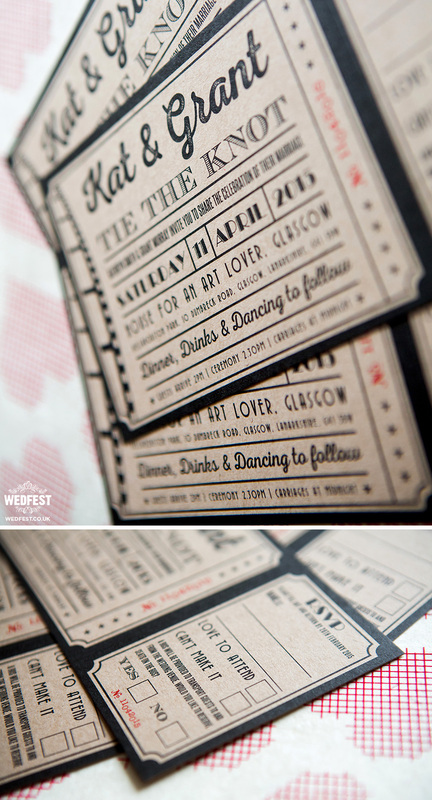 With just the very simple use of black and some beautiful typography and layout these movie ticket wedding invitations turned out amazing. 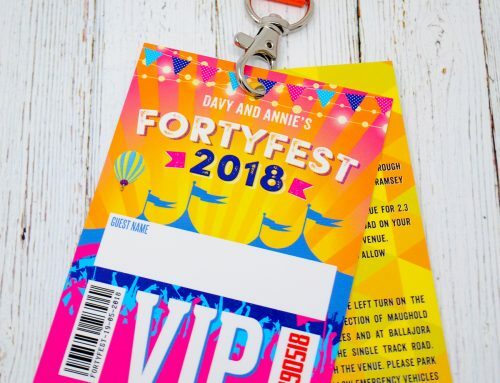 There is a lot of information being put across but the lovely design and layout means it doesn’t look overcrowded or busy. We have long been a fan of brown kraft card wedding invitations so we couldn’t wait to get these invites up on the website to show them off. 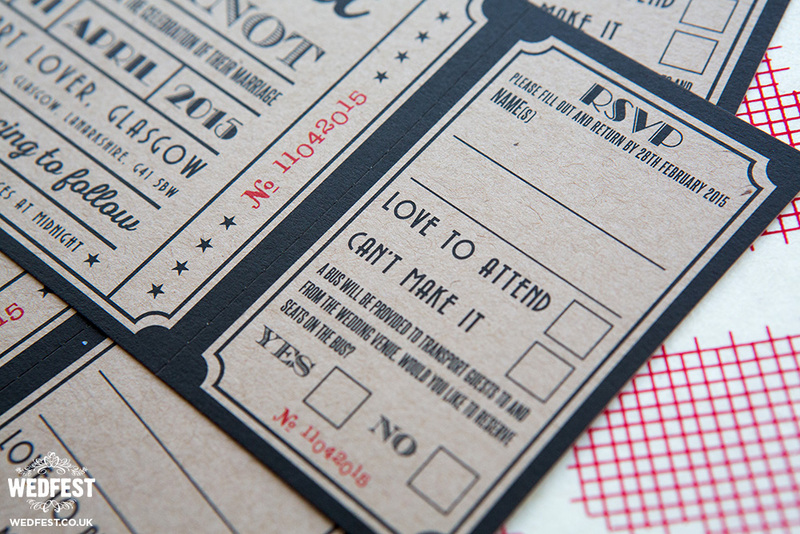 As the invites were designed as tickets the ticket stub serves as the wedding RSVP card. This is on a perforated edge much like a movie ticket or cinema ticket would be even now. There is space for the wedding guests to write their names, accept or decline the invitation and an area for the couple to collect names and numbers for buses they were laying on for the wedding. All the guests had to do was fill in the RSVP card, tear it off and send it back to the couple in a pre addressed envelope that was provided with the invitations. 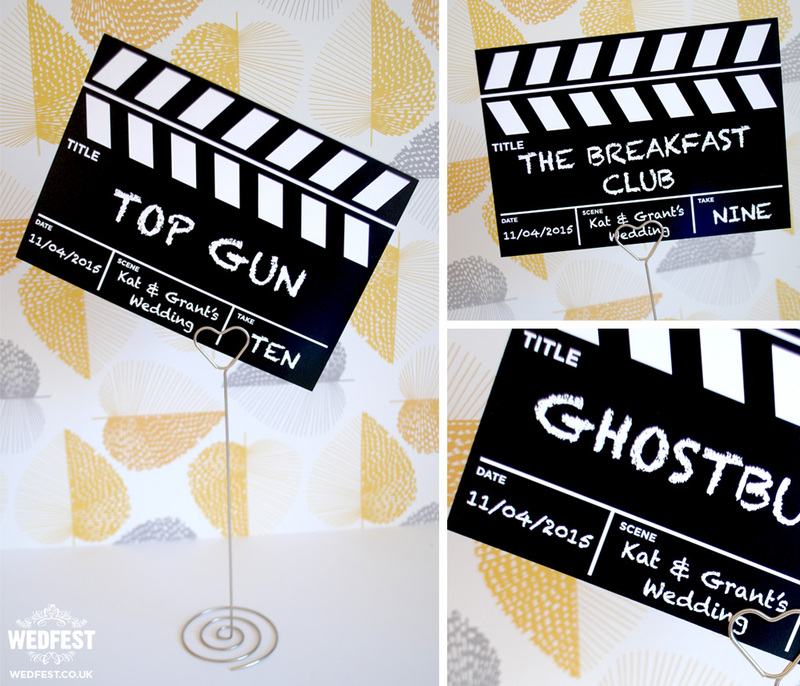 For the wedding day stationery the couple wanted to continue the movie and cinema theme so they asked us to create them a vintage cinema themed wedding table plan and matching wedding table number cards. 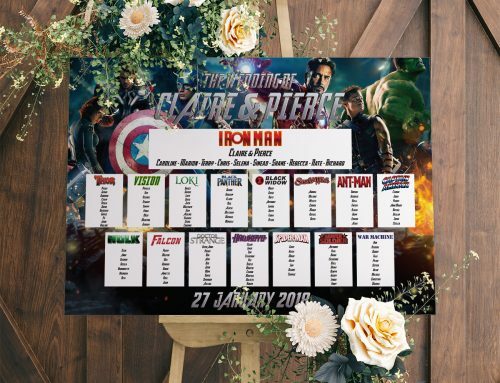 For the seating plan we continued the theme of the wedding invites and kept in with the vintage and kraft looking style, and included some references to cinema like old skool cameras / projectors and film reel etc. 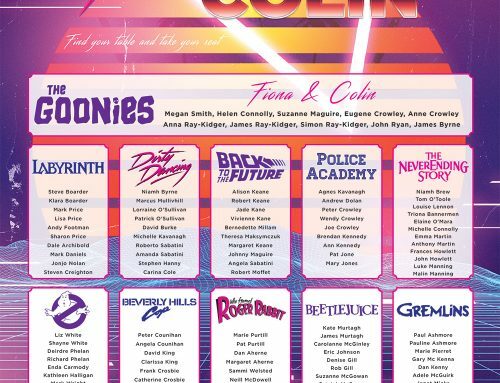 The wedding tables were all movie names which appear under screen numbers just like it is at a real cinema so Table 2 is Screen 2 which is showing back to the future, therefore table 2 is the named the back to the future table. For the wedding table name cards themselves the couple suggested make the table names as clapper boards. 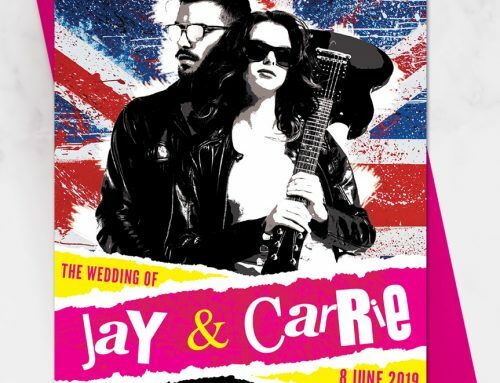 This of course is perfect as it perfectly continues the movie and cinema theme and also was an opportunitty to break up the design style in the wedding stationery. The clapper board wedding table name cards turned out great and perfectly compliments the rest of the wedding stationery. 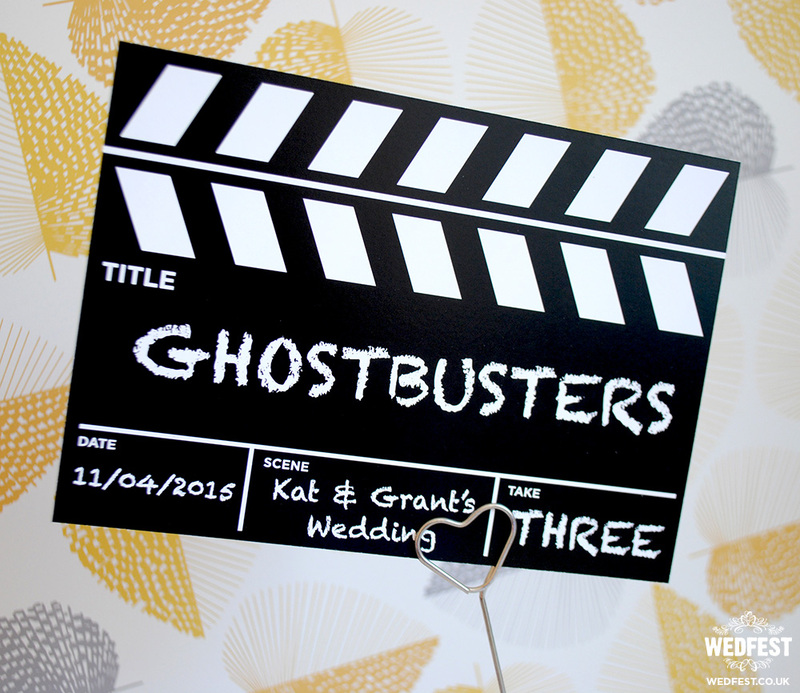 The clapper boards featured the name of the movie for the table name such as Ghostbusters, and the table number such as 3 and also some other small details on the wedding including the bride and grooms names and the date etc. 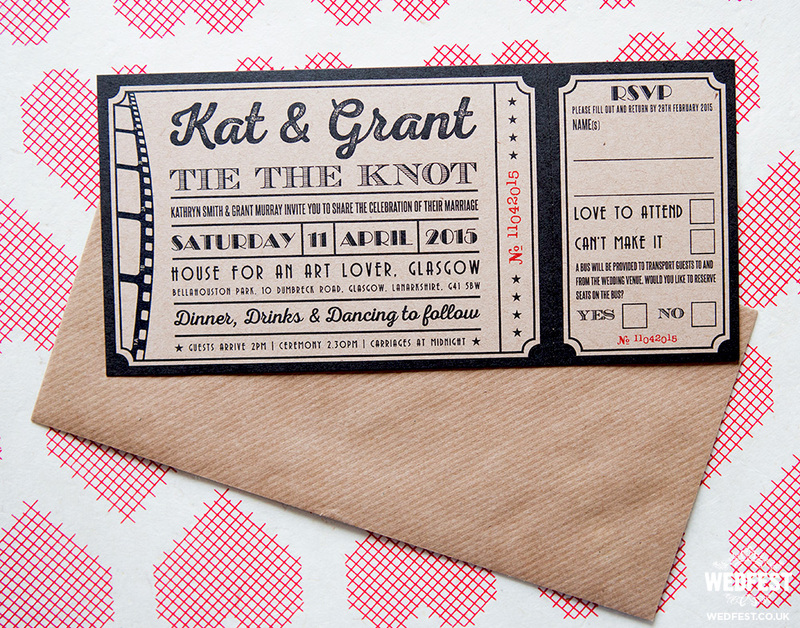 If you are interested in getting some vintage cinema ticket wedding invitations for your big day, or want to know more about kraft card wedding invites or wedding table plans or any of the wedding stationery you see on this website, please click here to get in touch and let’s put a touch of the silver screen into your big day.